Bringing your Star Ship the most Life like effects available ANYWHERE. Legion Force, which is compatible with our new Stereo Soundboards. Introducing our all new E/FX™ Plug-n-play light and sound kit for the Polar lights 1/350 POL950M/06 K'T'inga. “Star Trek the Motion picture” with awesome lights and sounds!! Forward and Aft Torpedoes are accurately timed to the movie. Kit contains 32 LEDs in all, controlled by 2x buttons. Button 1 fires forward torpedo and starts demo mode with music. Button 2 fires aft torpedo, and switches to Shut-off mode. During shut-off mode, either button will restart up the system. supply adapter. This setup makes your model very portable. especially when using the Radio control option. Optional Radio Control activation available. 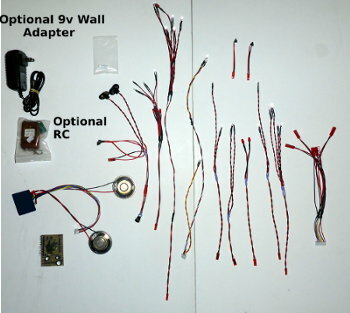 Optional 9v wall adapter available. if you are using the Stephen Burns 3D printed Grills. Option for lighting the Stephen Burns torpedo Tubes. Lower cost NON-Plug-N-Play kit also available. 1x Fully assembled Legion light board. 1x Stereo sound board with 2 speakers and harness. 32x LEDs Prewired to 9 separate harnesses. 1x Power harness with DC jack and 2x 9v battery connections. 3x Short pieces of plastic tubing. Option to choose if using Burns Torpedo Tubes. NON-PNP kit will have all required connectors and pre-wired LEDs in kit. Camera makes lighting look brighter and off color than how it actually looks. so be sure to check in regularly. Choose your kit version below. Stephen Burns nacelle Grills and Torpedo tubes are not included in our lighting kits. Links on this page will guide you to his page. The Plug-N-Play kit makes for a faster build with no soldering or electronics skills required. After reading Pin assignment for connections in the manual, you may completely test this kit right out of the box after installing a battery. The Non-Plug-N-Play kit provides the advance builder with lower cost and customization by either using the provided pre-wired LEDs, or he can add his own as well. The special forward torpedo as well as the pre-wired power harness are provided. Requires soldering iron, solder, 26awg wire. DO NOT USE LED TAPE. If you are going to use the Stephen Burns 3D printed Torpedo Tubes, be sure to check that option when ordering the main kit, default is NO. You can find a link to order the Stephen Burns torpedo Tubes in a lower section of this page. WARNING : The Legion board has both 5v and 9v connections. Failure to read the manual for proper light and sound connections could destroy certain LEDs. Plugging the sound board into a 9v connection will destroy it requiring the purchase of a new sound board. Optional Lighting for Burns Warp Nacelle Grills. Please do not order this option unless you have our main kit. Features 2 lighting P-N-P harnesses and diffusers to be used with Stephen Burns 3D printed Nacelle grills. The links below will take you to Stephen's order pages. Full Length Nacelle Grill version. This version is what you see below. Our main kit manual has install instructions, but you need advanced modeler skills to install them. This was left as an option so that those of you with a drawer full of power supplies wont have to purchase another one. This option is recommended for those that want longer run time than batteries can provide, especially when using the RC option. option below can be added to provide 2 button activation control to take the place of the onboard activation buttons. "A" controls button one, "B" controls button 2. Adding the lighting kits pushbuttons is always recommended. When ordering this option, your Legion board will have a wiring harness marked "RC". Please order this option at the same time when ordering your light and sound kit. It can not be installed by the model builder. If you are looking for the Forward and Aft tubes, here is the link: Burns torpedo Tubes. Make sure when ordering the main light kit that you mark YES for Burns Torpedoes. If you damage one of your harnesses from the main kit, replacements are available below. other setups and the purchase will be refunded.